The beauty of Stearns Beach in Ludington makes it one of the most popular beaches along Lake Michigan. While most of us can walk through the sand to Lake Michigan's shoreline, many cannot--those in wheelchairs or people who have motor disabilities. Even families have great difficulty pushing strollers or wagons through the sand. 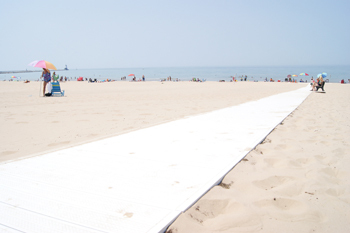 But this has all changed...Disability Connections of West Michigan and the City of Ludington partnered to install accessible walkways at Stearns Beach. Stearns Park Beach was voted the fifth most accessible walkway in the nation. The north walkway begins at the sidewalk by the North Concession Stand and covers the 300 yards down to the water. The south walkway starts from the concrete walkway out to the pier and continues down to the beach area. There is also a walkway in the middle of the beach. Two sections of 20 boards each would complete the semi-circle at the south walkway's end. Each board costs $100 and is available for engraving. For more information or to purchase a board, call Deb Wright at (231) 845-6445. There is a total of 600 boards that make up each walkway, with each board costing $35. Enough money was raised to build the walkway through various donations, including a large $10,000 anonymous gift. Firebird Laser Engraving of Ludington etched the names or special messages onto the boards, so generations to come can appreciate the beach and the community support that made this project possible. It's a small price to pay for such an important addition to Stearns Beach...allowing everyone to enjoy the beach and water.